Rishabh means bull, do you know once Shiva took the Rishabh avatar. The Lord Shiva Rishabh avatar story defines the bond of affection between Shiva and Vishnu. Shiva, Rishabh avatar story will explain the bond attachment between Shiva and Vishnu who are the primary godhead in the Hinduism. 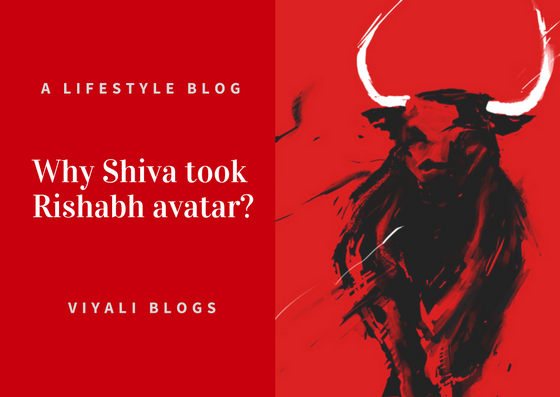 In this post, we have explained the Lord Shiva Rishabh Avatar and why Shiva took Rishabh avatar? Hinduism has the idea of Creation, preservation, and destruction. Lord Brahma holds the responsibility for Creation of the world; Lord Vishnu is responsible for the protection of Brahma's creation, and Lord Shiva is the destroyer. Therefore, Brahma, Vishnu, and Mahesh are known as the Hindu Trinity. Shiva and Vishnu are more influential lord in the Trinity distinguished as Hari and Har. Lord Vishnu is known as Hari, and Shiva is known as Har. In a contemporary form, both are equivalently powerful, and Vishnu meditates upon Shiva, and Ram Naam dwells in the heart of Shiva. The bond of affection is strong within Shiva and Vishnu. Both are devotees and Lords for each other. One of the most loved names of Lord Shiva is Vishnu Vallbha which means, the one who is most dear to Lord Vishnu. Similarly, Shiva holds a special place for Vishnu in his heart. One of the most beautiful phases of Shiva and Vishnu relationship is that Lord Vishnu is the brother of Goddess Parvati who is the consort of Lord Shiva. Once upon a time, goddess Laxmi went to meet his father Samudra dev, the ocean. Samudra dev welcomes her and tells that he is very fortunate that his daughter Laxmi got married to Lord Vishnu. Samudra dev told a significant thing to goddess Laxmi which generated stress lines on the goddess Laxmi forehead. Goddess Laxmi's father told her that his other five daughters Suvesha, Sukesha, Samisha, Sumitra and Vedah have also accepted Lord Vishnu as their husband. Samudra informed goddess Laxmi that his other daughters are indulged in penance to achieve Vishnu as their husband. That information makes goddess Laxmi depress, and she returns to Vaikuntha. At Vaikuntha, she inquiries Lord Vishnu about who is in Lord Vishnu's heart.? Lord Vishnu smiles and politely replies to Goddess Laxmi. Lord Vishnu - "Devi, you might be well aware that Mahadev resides in my heart's half part; as he is my Aradhya." Goddess Laxmi - "I hope, Swami, I'm on the other side of your heart." Lord Vishnu - Devi I'm the preserver of the world; I have grand duties for the world. In my heart's other part there is a place for the world, my devotees and You resides in that part." Goddess Laxmi - "World is dear to me too, Swami; but in my heart, there is only you. I deserve your complete love. If it is not possible, then you can take me out from your heart." Lord Vishnu was aware of the meeting of Samudra dev and Goddess Laxmi. On the other side, goddess Laxmi's all sisters were performing penance upon the name of Lord Vishnu. After their successful penance, Lord Vishnu appeared in front of them and requested Laxmi's sisters to ask the boon. They were all delighted to see Lord Vishnu in front of them. In their wish, they requested Lord Vishnu to forget the previous memories and become the husband of all of them. Lord Vishnu granted the boon by accepting all of them as his wives and lost his memory. According to the boon now Lord Vishnu had to forget his responsibility of being the patron of the world, and live in the Patal Lok (lowest realm) as a loving husband. Lord Vishnu shifted from Vaikuntha into Patal Lok; this disturbed the balance of nature and the world. That also stress goddess Laxmi, and she went to Mount Kailash for meeting with Lord Shiva and Goddess Shakti. Goddess Laxmi narrated the whole incident to Mahadev and Uma. After listening to Laxmi Goddess, goddess Parvati replied. Goddess Parvati - "Devi, Lord Vishnu is the protector of the world. How could you expect from him to have only you in his heart? We must understand that Shiva and Vishnu regard each other as their lords." After listening to Goddess Parvati, goddess Laxmi realizes her mistake. Lord Shiva gives his consent to bring back Lord Vishnu from Patal Lok. Lord Shiva took the Rishabh avatar and reached to Patal Lok. Lord Vishnu saw Shiva in the form of Rishabh, Due to loss of his memory Vishnu didn't recognize Mahakaal who was standing in front of him as Rishabh avatar. Bholenath was aware that only by attacking Lord Vishnu; Lord Shiva can invoke the divinity of Lord Vishnu. A fierce battle started between Shiva and Lord Vishnu. Narayan started attacking Lord Shiva with various weapons, but Shiva neutralized every attack of Narayana. Both were incredibly strong; hence, the battle was getting difficult. By seeing a Rishabh equivalently powerful in front of him, Lord Vishnu started using his deadly weapon. Shiva was neutralizing every weapon of Lord Vishnu. The war kept going for several years. Finally, Lord Vishnu's anger attained his highest level that Lord Vishnu attacked Lord Shiva with Narayan Astra. In Return, Shiva attacked Lord Vishnu with Pashupati Astra. In that way both get locked into each other deadly Astra. After seeing the deadlock of Shiva and Vishnu, Finally, Lord Ganesha appeared in front of all the sisters of Goddess Laxmi. Ganesha - "Lord Shiva and Lord Vishnu are complementary to each other, and both are stuck into each other weapon." Ganpati made realized to all the sisters of Goddess Laxmi that if this war remained continued this universe will end. Therefore, it is essential for the Lord Vishnu to attain his lost memory. After listening to Lord Ganesha, all the sisters of goddess Laxmi appeared into the war zone. Sisters of goddess Laxmi - "Lord Vishnu, please accept our mistake, we liberate you from our boon." As soon as the sisters of goddess Laxmi frees Lord Vishnu from their words. Lord Vishnu gets free from Lord Shiva's Pashupati Astra. The deadly weapon of Pashupati Astra returns within Shiva's aura. After that Lord Vishnu attains his lost memory and realizes that in Rishabh avatar, Lord Shiva was standing in front of him. Lord Vishnu immediately returns his Narayan Astra within his aura and Shiva gets free. Now Vishnu and Shiva both were free. Shiva attains his forms, and takes Lord Vishnu with him and reaches to Vaikuntha. After seeing Lord Vishnu again in Vaikuntha, goddess Laxmi gets delighted and give thanks to everyone. Shiva gets happy to see Lord Vishnu and Goddess Laxmi together again and after that Mahadeva returns to Kailash Parvat. In this post, we have described Shiva Rishabh avatar. If you liked the post, please feel free to share it on social media. You can also like our Viyali facebook page for recent updates or follow us on Twitter.